On Friday 24th April, ELI Africa, with the collaboration of Rogers Group, successfully planted 300 mangrove propagules in the region of Grand River South East. The objective of this activity is to work together with all stakeholders and the local community to conserve our marine ecosystem. Early on that day, a group of volunteers set their way to Grand River South East to make a difference in their community. Planting 300 mangrove propagules might seem to be a tiring task but as goes the guip, where there is a will there is a way. The volunteers attended a briefing session where they were explained the importance of mangroves and the procedures to follow to plant the propagules. “Recent developments have caused a decrease in the number of mangroves in some coastal areas and this has adversely impacted our marine ecosystem,” says Mr. Vedant Seeam, President of ELI Africa. “Mangroves are important to our marine ecosystem and they help to maintain a healthy marine life”, adds Mr. Luv Reedoy, project manager of ‘The Mangrove Project’ at ELI Africa. 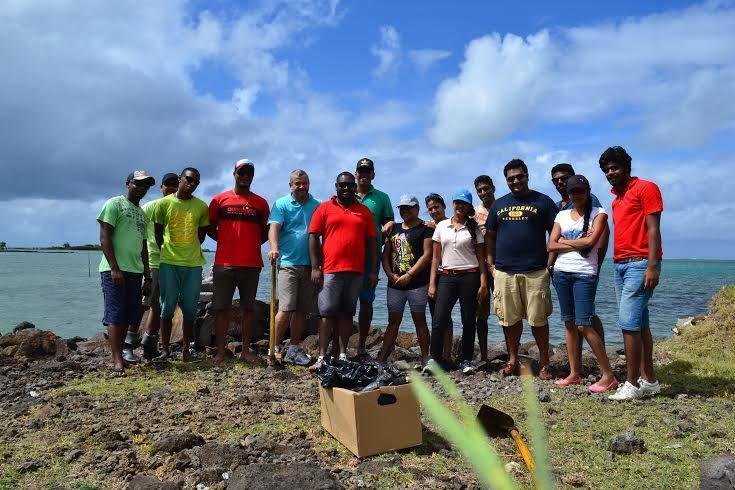 After the briefing session, the volunteers set to plant the 300 mangrove propagules which were collected at Quatre- Soeurs on the previous day. The participants had to dig small holes in the literally rocky area and plant the propagules. This task was easily accomplished due to organized planning and good team spirit. Many of the participants said they were oblivious to the importance of mangroves to our marine ecosystem and they congratulated ELI Africa for the initiative taken to conserve our marine ecosystem. Since 2012, ELI Africa has planted a total number of 14 400 mangrove propagules and the organization does not intend to stop its activities towards the protection of the environment here. In the coming months, ELI Africa is planning to hold another awareness day and sensitization event in the region of Grand River South East. The objective of this event will be to encourage local residents to partake in the preservation of our lagoon.